UPDATE: Jasmine sighting ~4pm Feb 27 "running across the grassy area from Powell Ln toward Clairmont Circle, so if you live in that vicinity (near Emory Woods Apartments) please keep an eye out." Message left @ phone number listed below. Jasmine is a scared, semi-feral foster who escaped while at DeKalb Animal Services, where she was taken to receive medical treatment for an urinary track infection. She appears to have made it to our neighborhood all the way from Kensington Rd. She is dragging a green leash and there are concerns that she may get stuck somewhere. 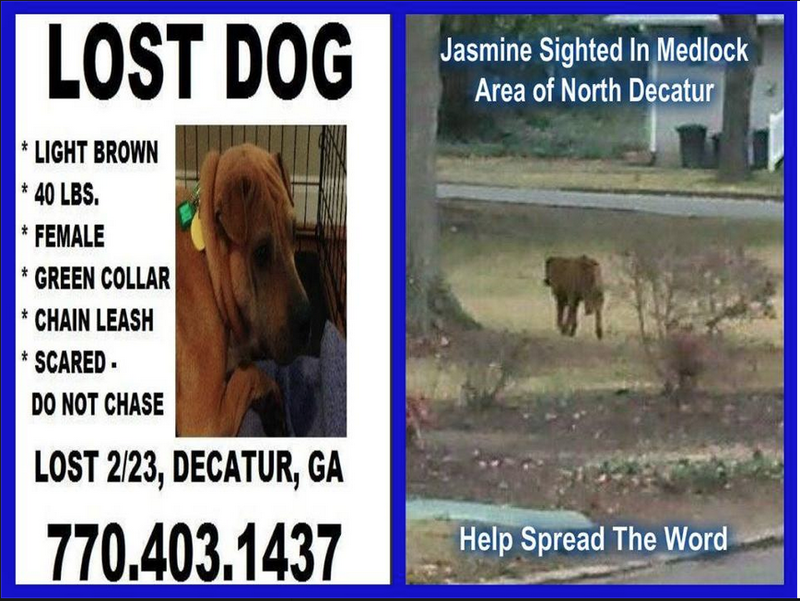 Jasmine was sighted in the Medlock area of North Decatur (Willivee) early on Feb. 26. She is very skittish and volunteers are trying to set up traps. It is possible she could be lured to a backyard if food were available. If you see her, please contact the above number.